Happy Monday! I can tell that I’m getting old because I am having the hardest time getting back into my groove after getting back from D.C. I got back a week and a half ago and I can’t seem to master the school/work/homework/blog/YouTube balance that I used to sort of have. I only have 3 weeks of school left and my Masters Thesis due in 2 weeks, so the anxiety is starting to kick in that I haven’t been to get a schedule down. Luckily I have fun and bright nail polishes to cheer me up! 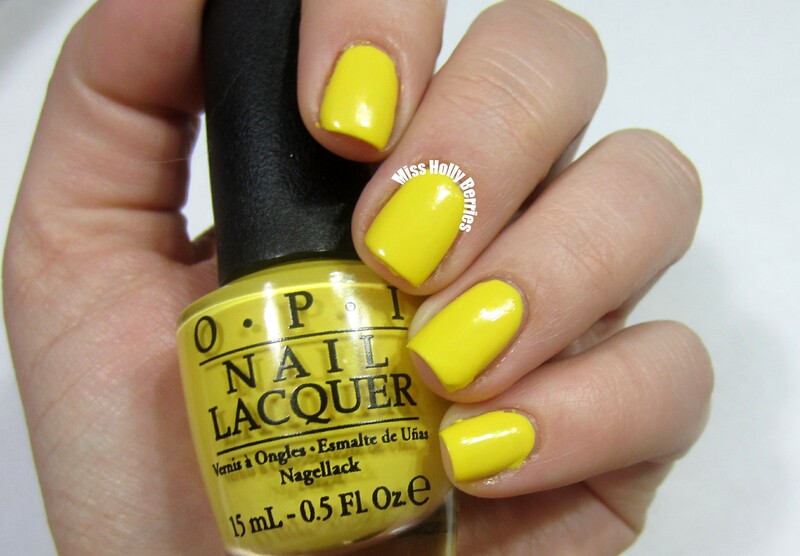 OPI “I Just Can’t Cope-acabana” is a bright yellow creme. So many people have been calling this a pastel but to my eyes, it definitely is crayola crayon yellow and bright. Please excuse my AWFUL paint job. My eyes must really be going because I thought this looked really good until I was editing the photographs. Whoops, it happens sometimes, and isn’t the whole point to show off the polish and not my ability to color within the lines? The formula of this polish was amazing for a yellow. Yes, you do have to preference “for a yellow,” because yellow’s are notoriously hard to deal with. Most yellows are streaky, thick, uneven and just generally difficult to wear. This was 2 coats that went on smoothly and not streaky. The dry time was average and the consistency was good. It’s gorgeous! Now I just wish I could find a pastel yellow with this formula and my polish life would be complete! I got this polish from Beyond Polish! Check out Beyond Polish for other collections, including the new OPI MLB collection (happy opening day everyone!). Beyond Polish was China Glaze, OPI, Zoya, Essie and more so you can find almost anything you’re looking for! What do you guys think? Did you get any of the Brazil polishes? ← Make Up For Ever Aqua Rouge 19 Review! My Brazil collection keeps sneakily growing when I am not looking. I started with just this one and Kiss Me… I now also have Toucan and Amazon. I still really like the neutrals from the collection but other polishes keep taking priority. You should check out the green from the coke collaboration (the PR Promo was discovered on the interwebs today by one of the OPI groups I am in). Oh geez… After seeing everyone’s gorgeous swatches everywhere I picked up 4 of these polishes (including this one) from OPI’s Brazil Collection. They’re all orange/coral. I wouldn’t mind picking up the rest of the collection… LOL. It’s never enough, is it?